This is a great recipe from the Fast Diet Recipe Book by Mimi Spencer. The 5-2 Fast Diet Intermittent Fasting really works, and is great for people like me who love their food and don’t want to deprive themselves every day! It’s based on the idea of 2 days of very low calorie intake – 500 calories for women, 600 for men – and 5 days of normal eating. Worth checking out if you haven’t already done so. 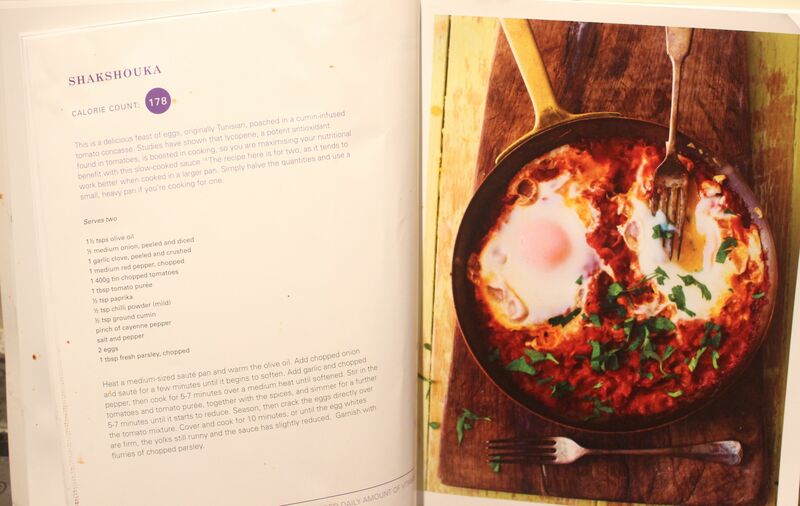 Dr Michael Mosley is the brains behind the concept. 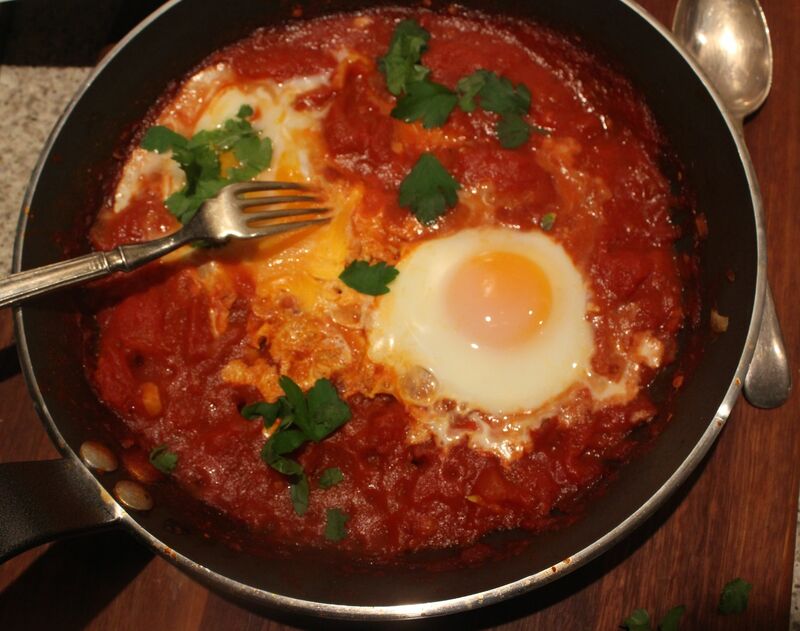 “Shakshouka is a dish of eggs poached in a sauce of tomatoes, chili peppers and onions often spiced with cumin. It is believed to have a Tunisian origin”. 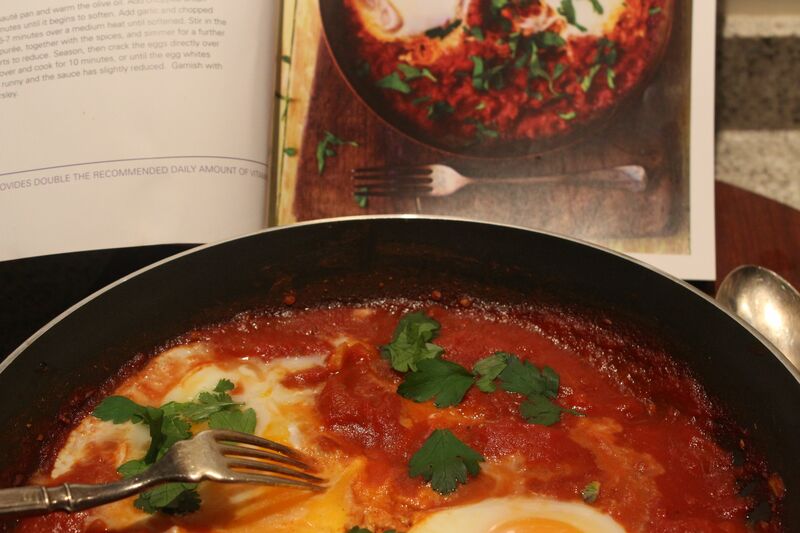 I love the dish as it’s so tasty and moreish and is great for breakfast or lunch or dinner! I omitted the red pepper in the original recipe as I don’t like them. Feel free to put it back in for the authentic recipe. The recipe serves 2, although even eating the whole dish yourself doesn’t break the calorie bank. Heat a medium sized frying pan and add the olive oil. Add the chopped onion and sauté for a few minutes until it begins to soften. Add garlic and cook for 5-7 minutes. Stir in the tomatoes and tomato paste, with the spices, and simmer for a further 5-7 minutes until the sauce starts to reduce. Season, and crack the eggs directly over the tomato mixture. Cover with a lid or a large plate and cook until the egg whites are firm but the yolks still runny. Scatter the chopped parsley and coriander over the top of the dish and serve, rustic style, in the frying pan. Posted in Breakfast, Savoury Food and tagged 5-2 Diet, breakfast, cayenne, cumin, dinner, lunch, paprika, tomatoes. Bookmark the permalink.